While the Pre-Pack sports 100% unique art and an imaginative design, the 10-pack case is more subdued. 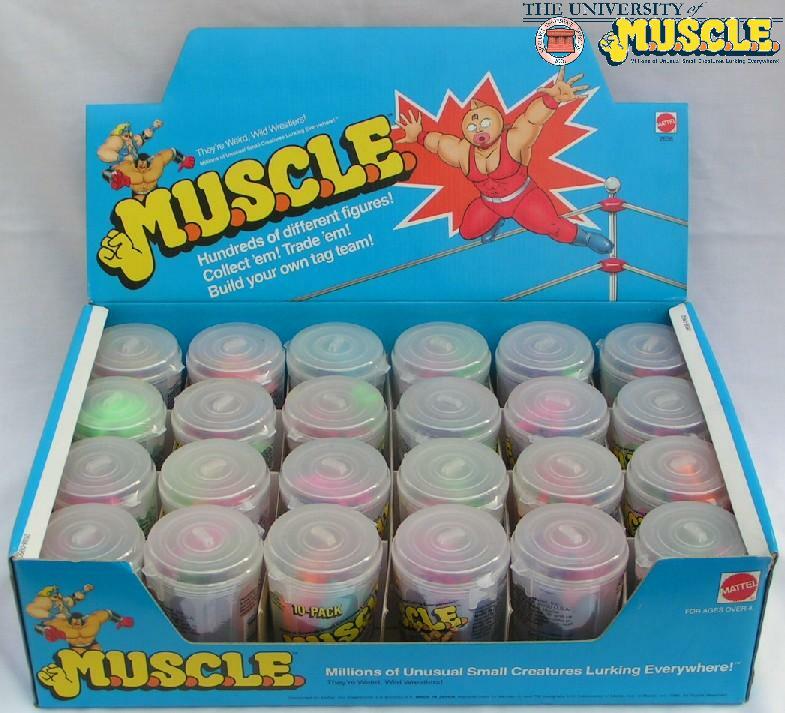 The case was designed to hold 24 10-pack cans and was not featured in any Mattel catalogs – unlike the Pre-Pack which was featured in the 1986 Mattel catalog. The top of the case, which becomes the banner over the opened case, is basically the front of the Cosmic Crunchers 28-pack. In fact, the only difference is that while the Cosmic Crunchers Kinnikuman does not have his Kinniku symbol, the 10-pack case does have the Kinniku symbol. The most interesting thing about the 10-pack case is why it differs so radically from the Pre-Pack. While the Pre-Pack showcases an inventive design with creative art choices, the 10-pack case uses existing images and a basic design. The design seemingly comes from, or is at least greatly inspired by, baseball card boxes. One viewpoint could suggest this case is a lazy, or a throw-away, piece by Mattel. Another perspective could suggest that it was a brilliant design. Garbage cans and an affordable price point would be the highlights of this piece. Additionally Mattel may have known this type of item would need to be displayed on a counter or table to be fully utilized. Usually this type of design ends up near the counter in toy stores – in impulse buy positions. There is also an interesting footnote to this piece. The 1985 Mattel catalog introduced a new advisory for He-Man – Hordak, the ruthless leader of the Evil Horde. 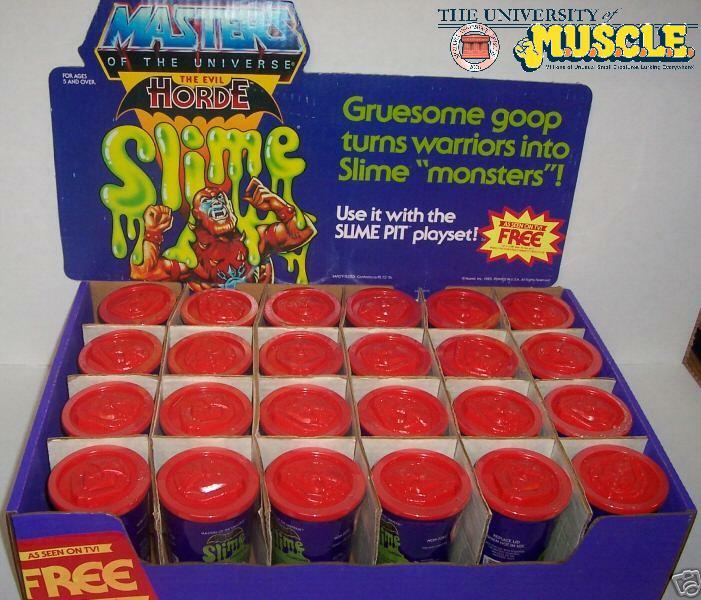 Then in 1986 Mattel introduces the Evil Horde playset, the Slime Pit. 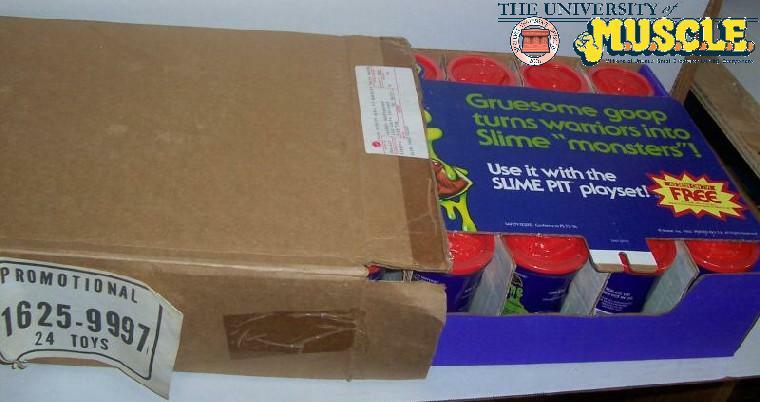 An accessory for this playset was a can of slime, which happened to ship in a garbage can-like container with 24 cans in a case. It is impossible to know for certain which display case came first, but there are clearly some common elements. Based on a picture from X-Entertainment there was also a version of the slime display that housed 48 cans. There are no recorded images of a 48 can version of the M.U.S.C.L.E. display. This entry was posted on Wednesday, June 17th, 2009 and is filed under Advertising & Promotion, Course Catalog. You can follow any responses to this entry through RSS 2.0. You can skip to the end and leave a response. Pinging is currently not allowed. M.U.S.C.L.E. cans came before HE-Man Slime cans. I recall very vividly the places I was living when both came out. As a kid we moved almost every fracken year, so it makes dating toy releases pretty easy at time. Of course, that’s not to say that you’re wrong. The release of the two display units could have been simultaneous. It’s also possible that their creation was simultaneous but their releases were altered by some unknown internal Mattel issue. If I was forced to venture a guess regarding their releases, then I would guess that the design originates from the Masters of the Universe – which was one of Mattel’s core brands. It simply seems logical that Mattel would have had more design/advertising dollars for He-Man. M.U.S.C.L.E. was relegated to “flanker brand” which, to me, suggests they would want to minimize the time/effort/money spent on M.U.S.C.L.E..
For me, the key is not the release date – but the haunting similarity between the two displays. Epilogue « University of M.U.S.C.L.E. The Official Nintendo Player's Guide featuring M.U.S.C.L.E. | University of M.U.S.C.L.E. 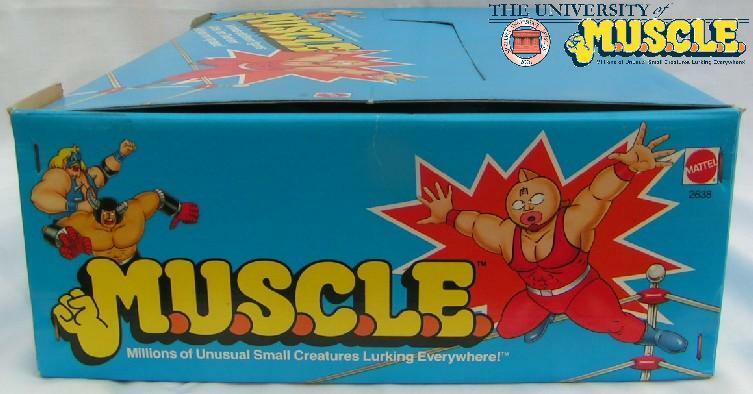 Auction Watch #99 - Interesting M.U.S.C.L.E. Auctions | University of M.U.S.C.L.E. 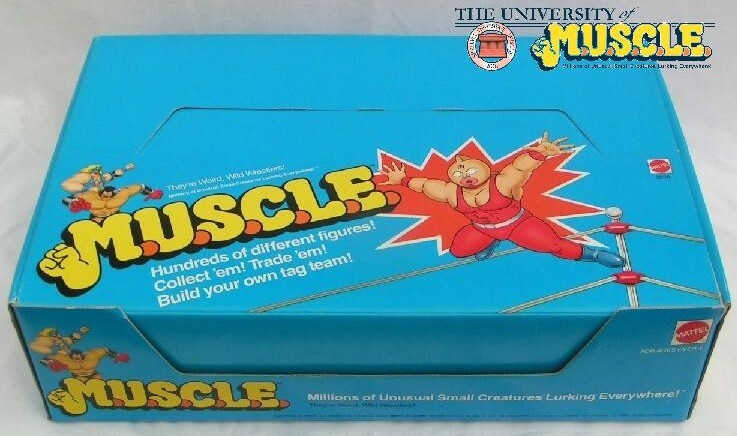 Auction Watch #116 - Interesting M.U.S.C.L.E. Auctions | University of M.U.S.C.L.E.